What is the Curl Revolution? The Curl Revolution is curls, coils and waves coming to the forefront of industries and lifestyle areas where they have been traditionally marginalized. 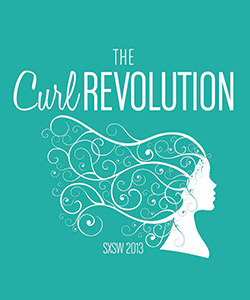 NaturallyCurly.com is partnering with TIGI to fuel The Curl Revolution by giving curlies the education and tools to embrace their curls through tangible, real-life and engaging online experiences. In essence: living the curl life. Did you know that over 14,000 conversations happen each week around curly hair? THIS movement was created and run by a community, let YOUR voices be heard and your hair seen! You can do your part by joining the conversation to empower the curl community! Throughout the week we will be meeting with naturally social superstars, aspiring natural hair bloggers and vloggers, curly musicians and NaturallyCurly community members, and sharing what we learn here on NaturallyCurly.com, as well as our Facebook page and Twitter. talk curls, coils, waves, and the naturally curly blog world. What: Join NaturallyCurly at the TIGI Dry Styling Bar to have your curls styled and photographed to be featured on NaturallyCurly.com. As well as seeing performances by The Flaming Lips, Paramore, Macklemore & Ryan Lewis, Tegan And Sara, Alt-j, Fitz & The Tantrums, Lianne La Havas, Atlas Genius, Icona Pop, and many more. Admission based on capacity. Not attending SXSW? Participate Online!